Madhusevita Dasa joined in Katmandu, Nepal in 1973 and was initiated by Srila Prabhupada in 1974. From the very beginning his contribution to ISKCON has been steady. Nowadays, a visit to the Mayapur or Kolkata temples, where Madhusevita Dasa served in 1974-1977 as temple commander in Mayapur and as vice president in Kolkata in 1977-1981, hardly reflects the austerities and hardships devotees such as Madhusevita Dasa performed during the 1970s. From 1982 onward, Madhusevita Dasa has been back in the country of his origin, Italy, where he has served as temple president at Villaggio Hare Krishna, supported by his good wife, Ali Krishna (a longtime BBT translator), and his son Nitai Prasad, a graduate of the Bocconi University and a practicing devotee. After becoming a member of the GBC in 1992, Madhusevita took up zonal assignments in parts of Italy, Malta, and Benelux as the GBC representative. He shares GBC responsibility for Benelux and Paris with Hrdaya Caitanya Dasa. Twice serving as GBC chairman, initially in 1997-1998 and recently in 2010-2011, Madhusevita Dasa has shown his commitment to the progress of the GBC in terms of strengthening relationships between GBC members and the larger ISKCON society as well as his interest in reforms that intelligently organize the leadership. 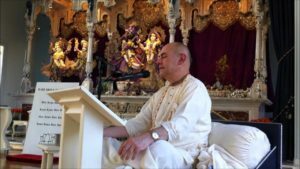 In addition to managing the temple at Villaggio Hare Krishna, assisting as a GBC representative, and taking care of his family, Madhusevita Dasa has been long associated with the Southern European BBT in the capacity of BBT Trustee since 1991. To balance this life of rigor and responsibility, Madhusevita Dasa is an occasional musician (guitar and vocals) and chef. His specialty is lasagna, the authentic kind whose recipe has been handed down generation after generation. He is known to serve his guests with incomparable hospitality and warmth.